Fall is my very favorite time of year and I’m not alone! We all love the beauty and bounty of the fall season. 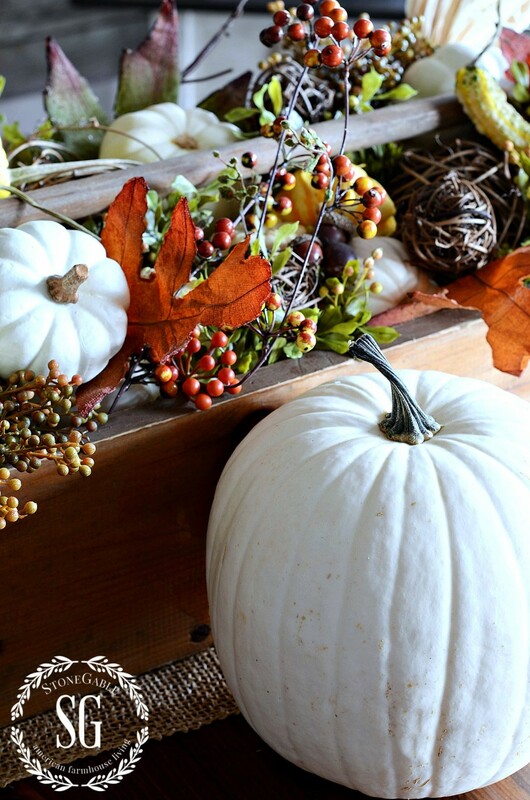 Let’s take those fabulous fall elements and bring them indoors and use them to decorate our homes. Just a few wonderful bits of organic fall bits and pieces will make our home fall ready! 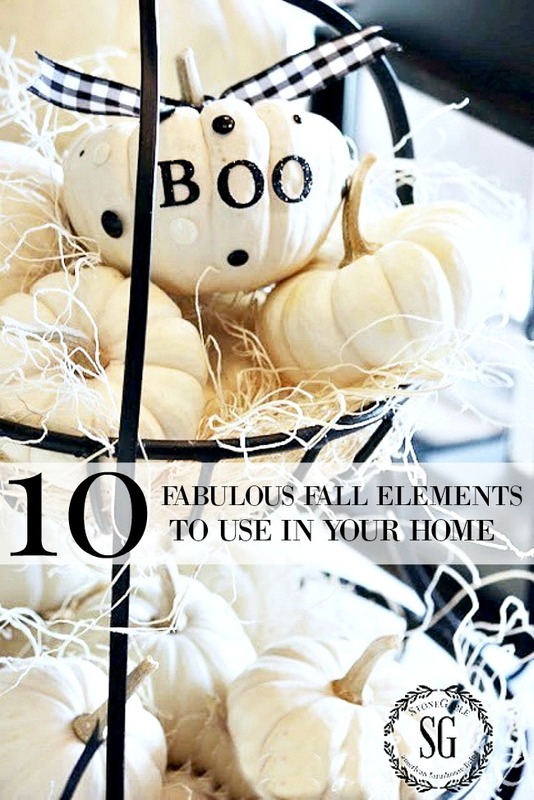 I’m sharing my 10 fabulous fall elements to use in your home! 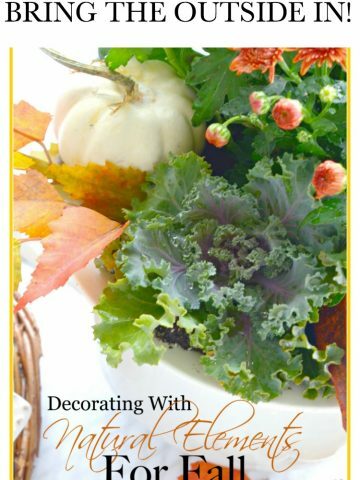 Get creative and use natural things this year to welcome fall! 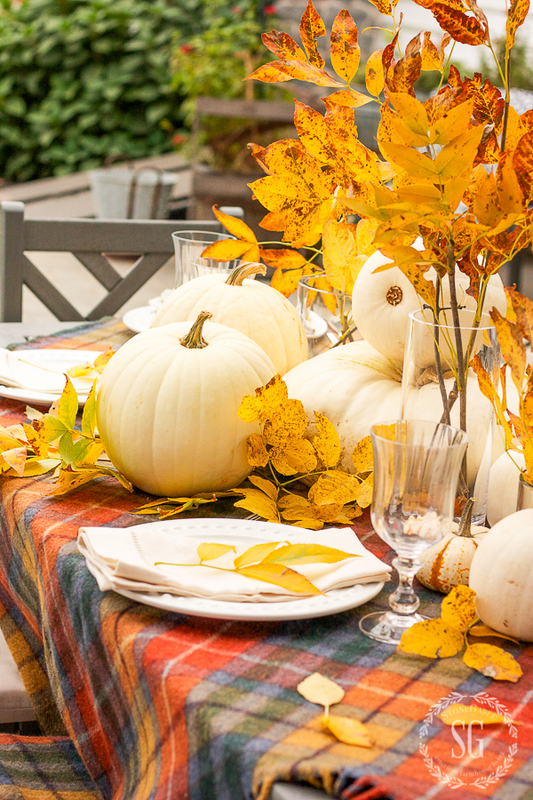 There are a few quintessential fall elements that most of us use in our home. Pumpkins are a must! How about pumpkins with a twist? 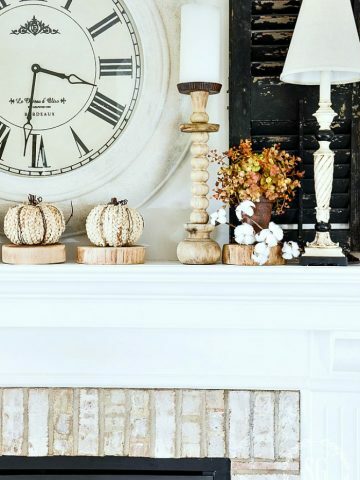 White pumpkins are here to stay… so let’s embrace them and add them to our decor! If you can’t find real white pumpkins…use great fakes! Bittersweet is what I call “fluff”. It’s twiggy and untamed and can fill up lots of visual space. Bittersweet grows wild in my area so I can find the real deal each year… but because it is an invasive plant illegal to grow in most areas, real bittersweet may be hard to find. If that ‘s the case buy some great fakes! Bittersweet is an amazing, natural fall element. It’s a fabulous filler! The bittersweet in the basket below is FAKE!!! What is fall without mums? I love these perfect, hardy, fall flowers! They last weeks and add color and life to our decor! So, we need to be nice to them and give them a pretty container to bloom in and some supporting fall elements around them. They look great cut in fabulous vases and pitchers. And they look amazing potted in urns or even a champagne bucket indoors! Deer shed their antler each year and grow new ones. And now those sheds are extremely popular in decor. And no wonder! They are beautiful and organic and fit into vignettes and decor bringing their fabulous shapes and ivory-like color and great texture! I find lots and lots at barn sales, country markets, and vintage shops. 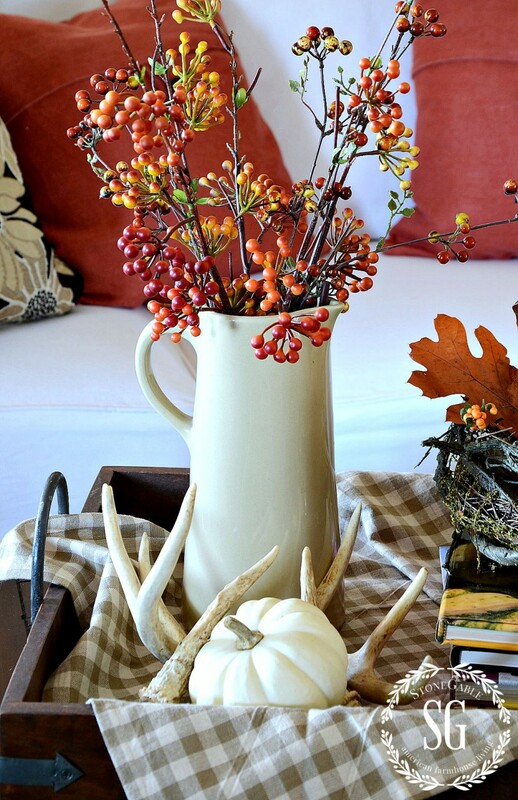 Make sure to include at least one set of deer sheds in your fall vignettes this year! Gotta love big pumpkins… especially if they are stacked! I like to stack different colored pumpkins. Keep them real and really fabulous! Don’t worry if they are not perfect. Think of it as “character”! 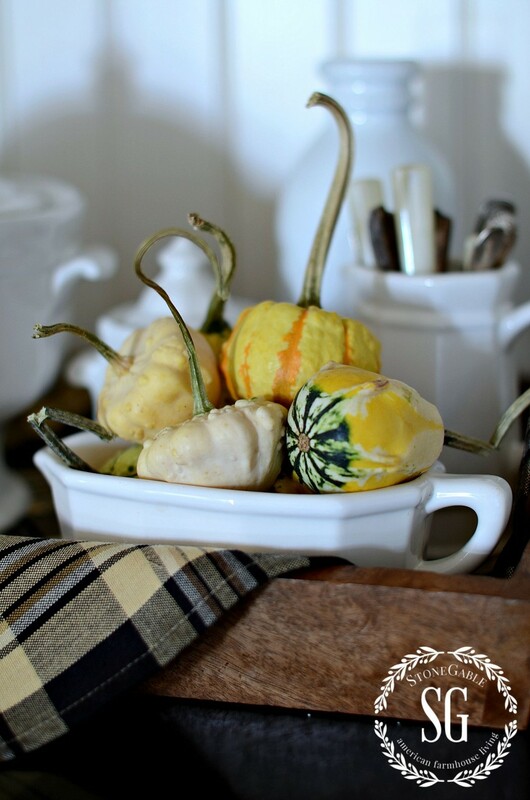 We grow our own gourds each year and they are great for fall decorating. My favorite way is to pile them in something ironstone, like this white gravy boat! White dishes and these funny little fall ornamentals are a perfect match! Choose gourds with long and interesting stalks! Hydrangeas are a flower that are such pleasers! They begin to bloom in early summer and keep going straight until fall. Then in fall they can be dried and used for the rest of the fall and winter! And the best thing about hydrangeas… they are GORGEOUS! Make a wreath, create a beautiful bed for a pumpkin or pile them up in a vintage tool caddy! They are amazing! Try mixing hydrangeas with other fall elements like these pumpkins! Yes, nests! They are perfect to hold little pumpkins, gourds, a handful of acorns or a some colorful leaves! Let’s stay away from real nest that could carry bugs and germs and stick to fun faux ones! Pinecones are not just for Christmas and winter. They are fabulous as a fall element! 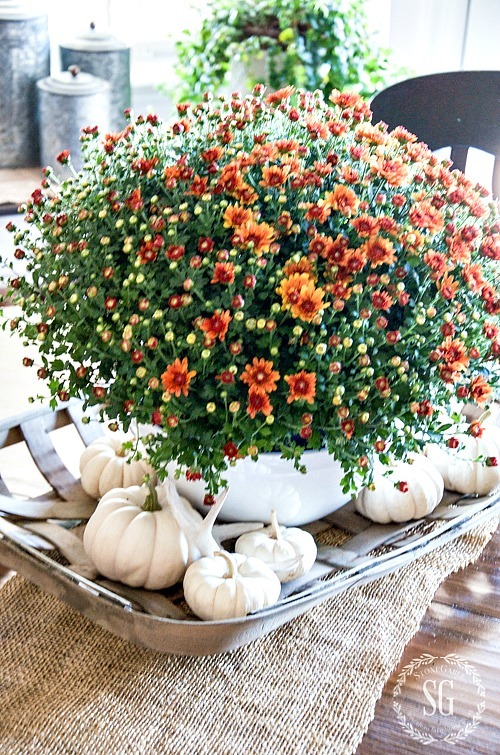 Mix them into a bowl of pumpkins or tuck them around the base of mums! Once you use them in fall decor you will love love love them! Don’t forget to bring a branch of colorful leaves into your home to celebrate fall! Put it into a great tall container! It should last about a week or so! If you celebrate fall before the leaves begin to change, like me, then “fake it” till the real ones are ready! Want a sensational fall wreath? Make it out of Indian corn. It will be the talk of your neighborhood! 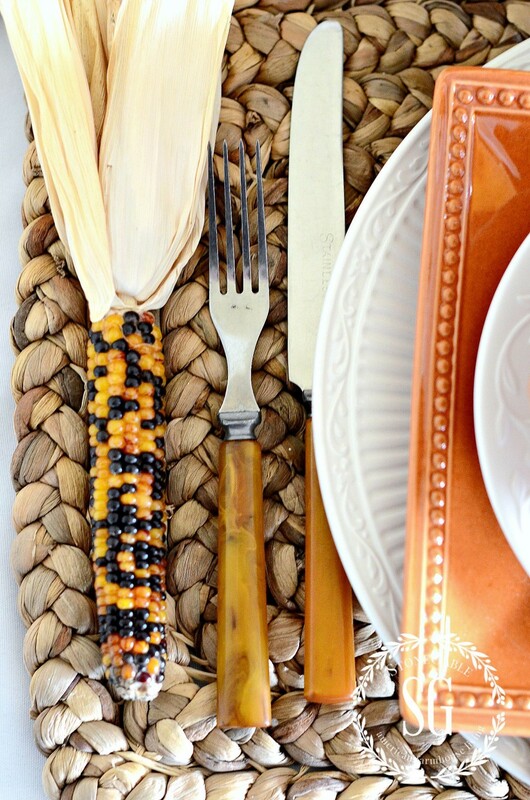 Try this easy to make INDIAN CORN WREATH. Indian corn can also be used in small ways too! Group a bunch around a big fat candle and tie it all together with raffia. Or fill a dough bowl full of them. Or wouldn’t they look so interesting gracing a fall table? Indian corn can be used from year to year if you keep them in a plastic box with a tight lid so mice don’t get to them! Have I inspired you to bring the bounty of fall indoors? 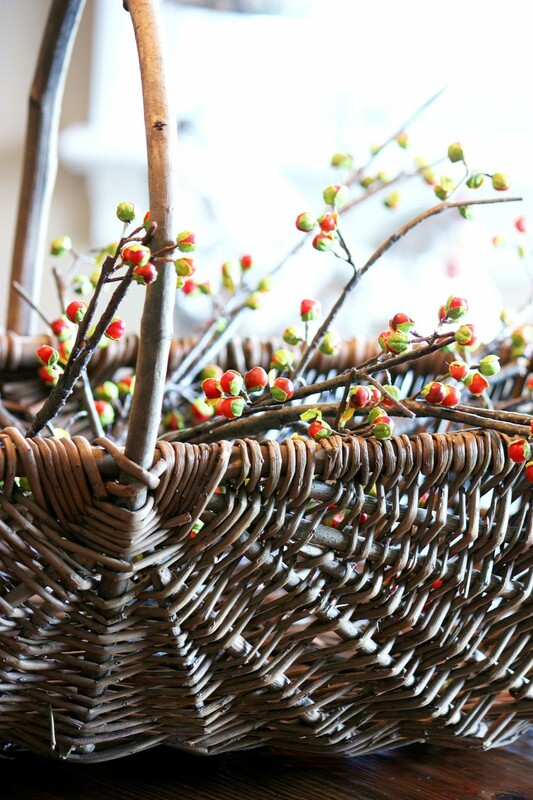 Tuck the beauty of the season around your home this year! You can follow me on Pinterest HERE and see all the great things I am finding to pin every day! Thank you for your inspiration!!! Although I’ve been a self proclaimed decorator for years I’m super impressed with your decorating style and my new passion is creating vignettes all over my house!!! I use antiques..new pieces..and beautiful things from nature. You’ve inspired me to revisit my home with fresh eyes. Thank you! Thanks Tammie! Looks like we have the same passion for creating a lovely and welcoming home. Love all the beautiful fall decorations! Now, maybe I will get started. It’s a wonderful time of the year!? Wondering what inspirations you’ll send in the days to come! Love your new look on the blog.. Love the post Im gathering now for the next season not a lot but Im having fun. Thinking about stacking a few plates. Will have to reread your post on playing with plates. I just love your decorating tips. Where do you find your faux bittersweet and leaves ? I usually find them at local decor shops. Look local for things like that. I love your ideas!! I do a lot of decorating and this is so me!! I love autumn, the fresh smells, the changing colors, and especially the lack of high humidity and heat. Thank you for all your excellent suggestions. You’ve given me so many new great ideas for decorating this season. When are you going to publish a book? You have such great ideas and beautiful photography! Yvonne, I’m loving the changes to your blog, personally it’s more user friendly. You inspire me everyday with beautiful ideas whether there indoors or outdoors. Thank You!!! Love you decorating style and so love white pumpkins! Love the fall decorations, I am a SPring/Summer person myself, but do like changing the seasons with decorations, love the pumpkins, never used white ones but ther are pretty with your other items, love it. I love fall and all of the magnificent weather and decorations! I will wait until the middle of next month to decorate but look forward to the excitement of doing so! Love your posts. Thank you! I don’t know what it is but there’s something about Fall that I just love. Lots of great ideas…I especially like the wreath made out of the Indian Corn! You’ve inspired me. I’m definitely going to plant two hydrangea bushes. They add so much beauty outside and then inside. Just bought a large glass cloche with a stemed base and was wondering what to put in it.Your idea of the little pumpkin in the nest with some berry garland will be perfect. Always get such great ideas from you Yvonne. All great ideas, I will have to re create some in my home. I love the inspiration in all of your posts. Love your pictures! I fell in love with white pumpkins last year and painted some faux ones which turned out very realistic looking! I loved the pictures of the white pumpkins and the bittersweet together. I always found it hard to find real bittersweet so I grow my own for years and have it shaped in an arch twirling around a copper pipe and so I have a supply of it. I do like faux bittersweet though as it is less messy. Beautiful pictures! Every post you make gives me food for thought. Where did you get the little, little, black footstool you use so often? I’ve tried and can’t find one. Thx. Gotta try that wreath! Gorgeous! Absolutely gorgeous! Fall is my favorite time of year and I will definitely be incorporating your ideas. Thanks for sharing. I love all of the suggestions you have shown for Autumn decorating. Thanks for sharing. Thank you for the lovely Fall ideas. I love the Autumn season. Loving the white pumpkins! Also love the greenish grayish one at the top of your stack! Fabulous color! What a beautiful post. Fall is my favorite season to decorate. I love returning to your blog to see all the wonderful ideas you have! Beautiful ideas – you are really inspiring me to me my fall act together!! I just bought 3 letter monograms for my white pumpkins. Lots of inspiration here. I’m happy to see you’re still using antlers in your autumn decor. I have several and love them for fall/winter decorating. I’m absolutely in love with the small white pumpkins. So cute! It’s still too hot here and I’m going on a three week vacation, so I’m still in summer mode but will keep this post for reference later. 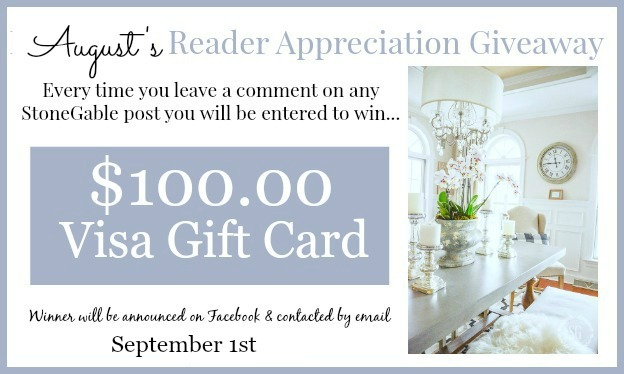 Love your post today…..beautiful decor. I am trying to wait until September to decorate for Fall but I am eager. YES! You have inspired me! I have always used the items you listed except nests! I never thought of it! I surely will this season! I love the look! 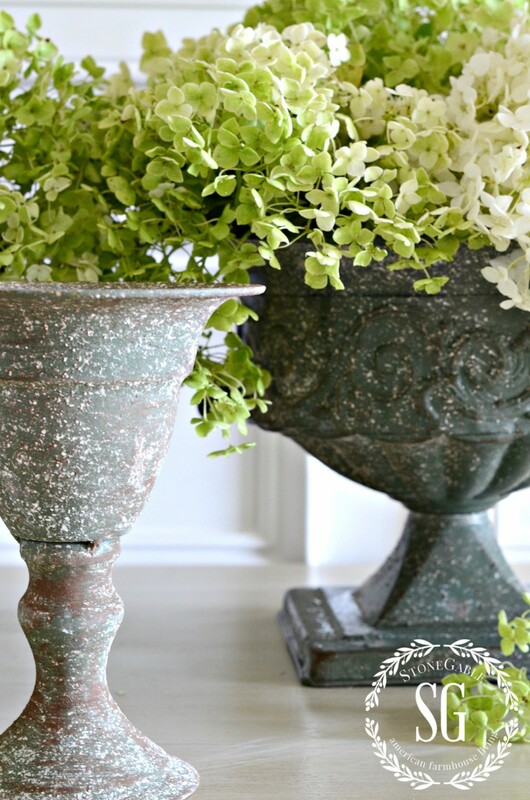 White pumpkins and green hydrangeas…BEAUTIFUL!!! It is SO hot in Alabama, just thinking of cool, fall weather is a nice reprieve. While visions of fall dance in my head. I opened my email instead and what to my wonderous eyes should appear but wonderful inspiration from Yvonne today. Thanks for making my day and all the research you do to make your blog so welcoming to us followers.Have a great Monday. Here in Illinois we are gearing up for the eclipse of the sun???????? Fun and inspirational–but I’m hanging on to the end of the summer for a couple of more weeks–even though some of the U Picks are getting ready to open, and some of our leaves are turning! I love the look of that bittersweet. I’ll have to look for some. Blessings! All your ideas are wonderful. 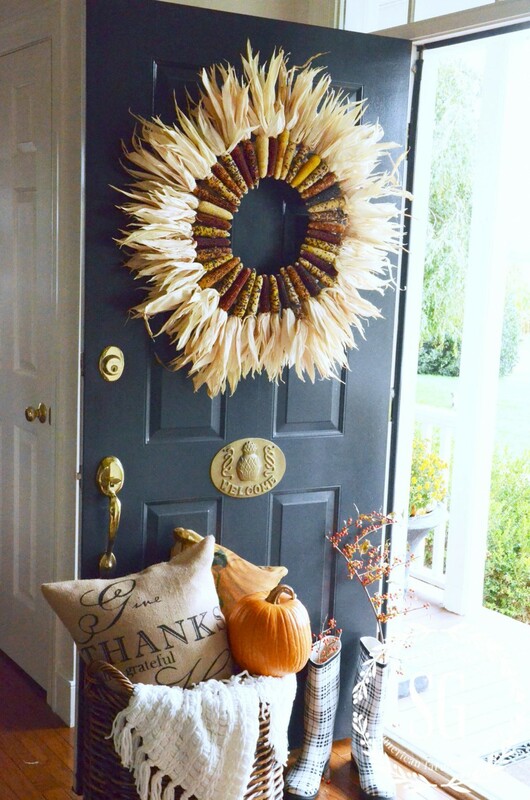 Love the white pumpkins and the Indian corn wreath. Going to create one of my own. Have a fabulous Monday, thanks for sharing and all the work you put into your blog. You are the best!! So beautiful and wonderfully inspiring!! I’m never disappointed when I read your blog. What beautiful ideas. I can’t wait to try some of your ideas! Beautiful. Yes, you have inspired me to bring in the bounty of fall into my home. I can’t wait for the pumpkins to get here. This is a favorite post because of the photos you chose for the visuals. It gives tons of ideas. I’ve never lived in an area that had bittersweet and did not know the name of my faux berries I’ve used for years!!! I started stacking pumpkins and I too love the look. But I have never tucked greens in my pumpkins and guards. That is a great idea. Plus the Indian corn wreath!! It wasn’t in the stores yet but it’s a “want to do” project! Thank you for your hard work on our behalf. I remember that as a child, my favorite season was fall. I think it always brought a sense of gathering closer with my family, sort of coming back into the warmth and safety of family after running wild and playing outdoors all summer. Mums look great but be aware some people are very allergic! My mom is! can’t even have them on the front porch. Loving my fall decor! Thanks for the inspiration!!! Loving my fall decor! Thanks for the inspiration! I love the white pumpkins!!! I use so much red and black in my decorating that orange never worked so I am so happy with your whites and neutrals which will now make my reds look really good. Thank you so much! I love your large pumpkin pillow! I have had a hard time finding bittersweet that looks decent. You have inspired me to use gourds in fall decorating. I have added white pumpkins to my fall decor. Thanks you simply yet super cute!! 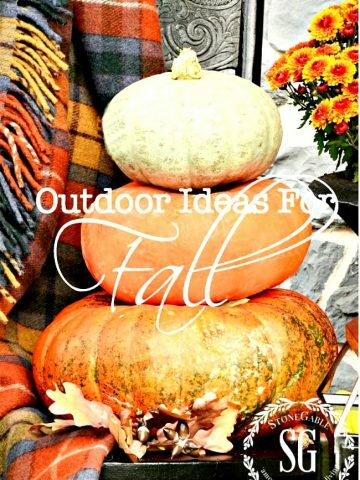 Great fall ideas. I love your assortment of fall pillows. Always looks great. I am beginning to embrace fall, although today the heat index in St. Louis was 101. I bought a large faux pumpkin and 2 smaller ones. These will be my DR table centerpiece surrounded by fall leaves, pine cones and ribbon. I also bought a pick with gourd, pumpkin, bittersweet and fall leaves to replenish my “worn” door wreath. I bought a medium sized pumpkin (cream color with golden speckles), filled with fall leaves, quail feathers, pine cone, wheat and dried corn husk stem. I also want to buy a couple of fall pillow covers, but don’t know where to look. It’s fun to replace “old things” with a fresh look. I love your pillow. Yes, Fall is definitely my favorite season. and my favorite holiday, Thanksgiving. Hi Yvonne: what a beautiful post!! 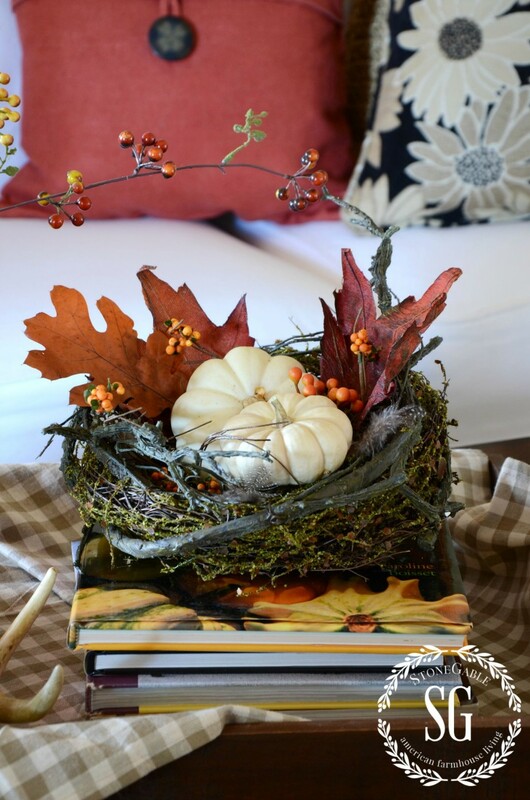 Your idea of placing a pumpkin in a nest is SO perfect … I never thought of that and I was just about to tuck a nest away until Spring but not anymore! I used to feel a bit left out when Fall came as my decor clashed with the bright reds and oranges, etc. but not anymore now that we have white and soft blue pumpkins. Thanks again for today’s inspirations! Thanks for reminding me of the fun that comes with fall. I missed spring and summer decorating due to surgery and I’m looking forward to fall. You get my day started each morning! Fall is my favorite and I love all your ideas. Yvonne, I look forward to each season because of you! Thank you for all the inspiration you give! I am retired and my home is my hobby! I have so much fun making tthings for my home! I love your blog, every one of your arrangements are absolutely gorgeous! 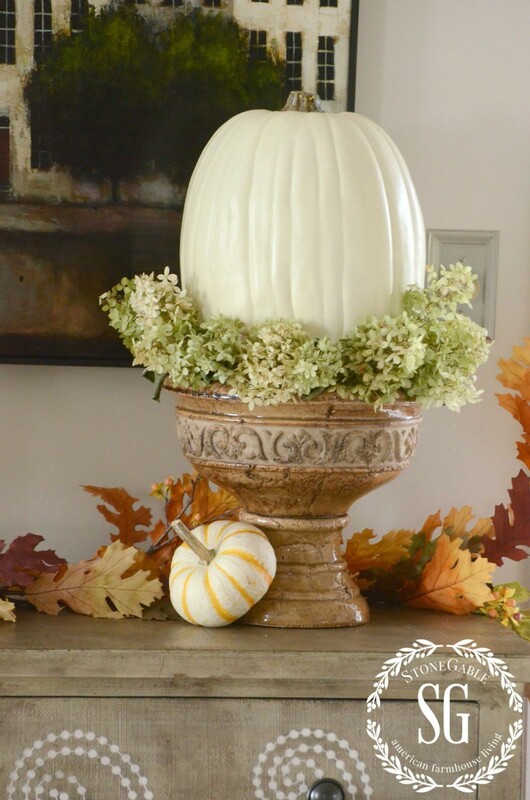 I’m planning to create the hydrangeas and white pumpkins in tool caddy for our Thanksgiving centerpiece this year, can’t wait! Ooh ooh…my goodness! I am so loving all the fall decorations! I tried entering for the drawing but must have been so excited that I hit the button before I typed in my message. So not sure if my name will be entered since the message field was left empty by mistake. Nontheless I want you to know that I adore those velvet pumpkins and each lovely setting you used. I so appreciate all the work you and team do to bring us such wonderful ideas! Fall is my favorite, too! I love, love your fall posts. Last year, I think you had acorns you had made from sweater material and I wanted so much to try and make those. Maybe this year! Thanks for all the beautiful inspiration!! Great decorating ideas! I love your Indian corn wreath on your door!! Love ALL your great ideas Yvonne! I just finished the green apple wreath for my front door this weekend! I love all the lighter pumpkins and of course the hydrangeas. I can’t wait until Fall comes to North Florida! It may be a while! thanks for a wonderful blog! Thanks for your great idea, one may never know what you can get if you don’t ask. Fall decroating here I come? Hi Lynn: if you ever feel like making your own, check out Lucy at The Craftberry Bush. She and Yvonne’s blog are two of my favorites. Yvonne, I love to read your blogs! Beautiful and so thought provoking, thank you. 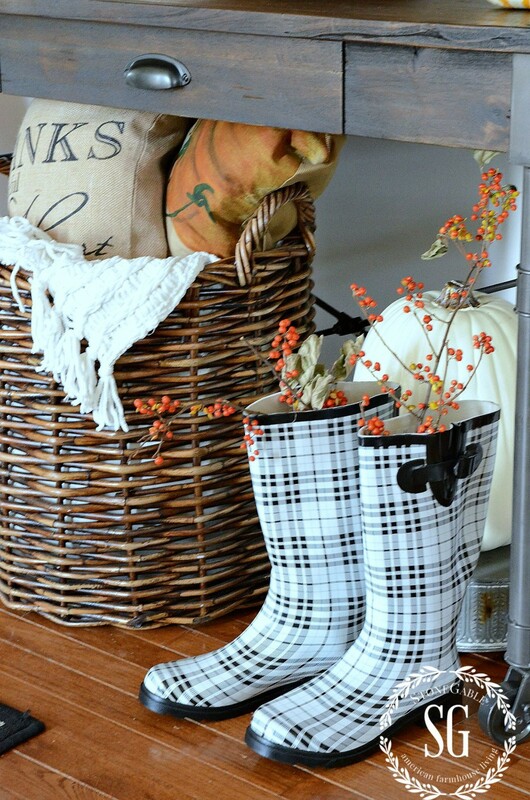 Yvonne, Thank you for today’s perfect recap blog of so many of your fabulous fall decorating ideas. I plan to pull it into my decorator folder to give me inspiration for next year. You are amazing and I so appreciate your blog!! My house looks the best it has ever looked for fall and so much of my inspiration comes from you! Hugs!!! What color is your front door? I love the warmth of it. It’s a happy mistake! The paint was the wrong color when we got it home but loved it and painted it on the door. Another inspiring message. I love everything. Come to Minneapolis and see our leaves turning color. I absolutely love your blog!! Your sweet spirit comes through with every post. Fall is a special time of the year where we spend more time outside(I live in Texas) and dwell on being “thankful.” Through your posts, I have found my gift of giving and hosting, so thank you for all you give back. Donna, How sweet of you to say! So happy to inspire you Silvana! 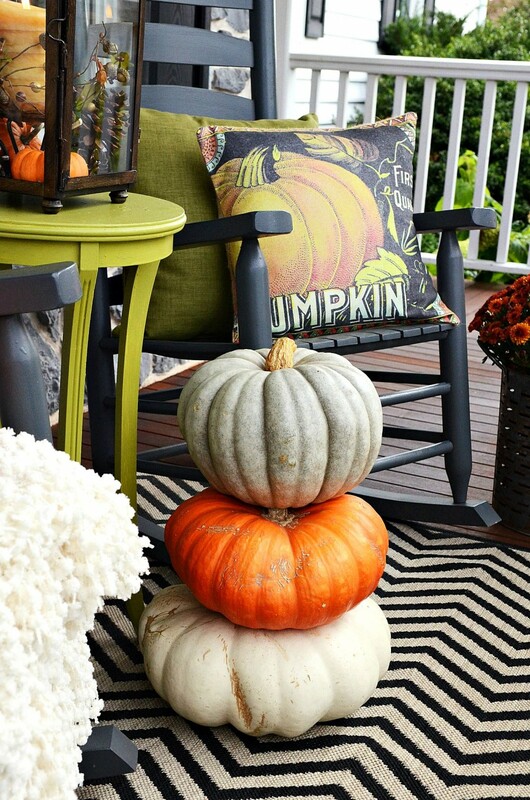 I love your decorating style…imagine my horror today when pausing to admire the 2nd photo in this post of the white pumpkins and it suddenly disappears and is replaced with a huge pop up ad! These ads really interfere with your wonderful content and lovely pictures. Please find a better way! A devoted blog reader. Carol, I know that these ads can be a little distracting. Putting out a daily blog like StoneGable is extremely expensive. And if I would not have ads (and yes, those that appear at the bottom of some of my images occasionally) there would not be a StoneGable blog. There is no better way, unless I ask my readers to pay to read StoneGable like a magazine subscription. And that won’t happen! I work well over 60 hours a week to create a beautiful image rich and content reverent blog with you in mind. So I hope you will ignore the ads if they don’t interest you and focus on who much I love my readers and work my hardest for all of you. I am really doing my very best to create a beautiful free place for readers to come and be inspired!!!! Thanks for your honest concern. in Autumnal Home Decor, I could smell the Pumpkin Pie throughout your home!!! is the awakening of the senses!!! Thank you for always sharing and inspiring!!! As the cool breeze is blowing in my window this morning I really enjoyed looking at all your fall ideas. I love decorating with pumpkins but the stinkin’ squirrels chew them and make a real mess! Got some fake ones last year but didn’t realize how light they were and found them rolling down the street on the first windy day! Now that it’s Labor Day I feel like I can start putting out my fall decor!! Aaaaahhhh Fall ! Here in North Central Florida it is not even vaguely Fall like as yet. But I am making it so in my home. I started incorporating pine cones in mu Fall décor years ago as I luv the contrast of the brown against my creamy white. I got rid of most of my bright oranges and russet…. It j7st didn’t seem true for Florida. I found that I know like the creamier side of Fall in my home. But I still luv seeing all the Fall colours in all my blog friends décor. Let the Fall décor begin. I luv your ideas Yvonne… And your beautiful home! GEE, LOVE how you are embracing fall in your area in your way! What wonderful ideas. The vase with the mums is beautiful. Thanks for great blog. 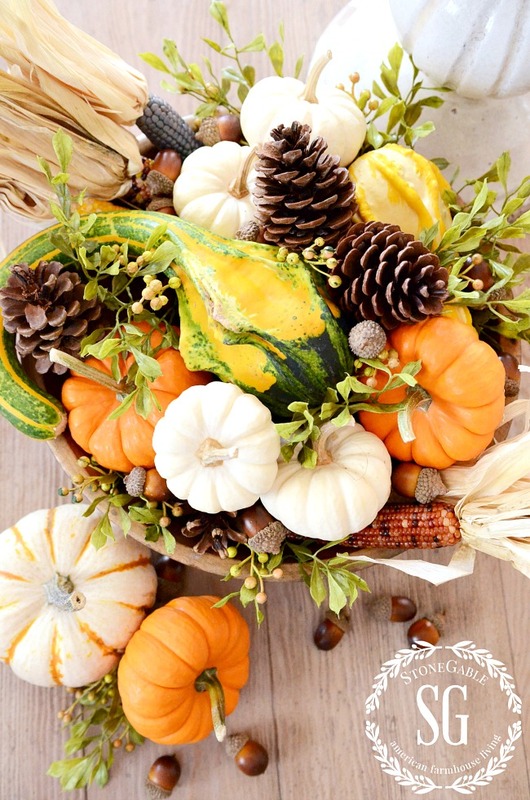 Thank you for the wonderful ideas for fall….some of them I’m already incorporating into my decor, but you shared fresh ideas, as well, that I can’t wait to try! I so enjoy your blog and am looking forward to more fall posts – it’s my favorite season of the year, too! Beatiful ideas. I love the hydrangeas with the white pumpkins. If I can’t find the white pumpkins I want in a particular size, I make up some chalk paint with whatever whitish colored paint I have at the time. I might try some other colors now that you posted the pic of the stack of pumpkins on the porch. Thank for the inspirations!! I am writing to you from Ontario, Canada. I wanted to take a moment to thank you for sharing all of your beautiful ideas. You are so inspiring! I recently stumbled across your website and have thoroughly enjoyed everything from your home decor ideas to your recipes and everything in between. I look forward to my daily Stone Gable emails for fresh new ideas and daily projects. Thank you again and Happy Fall!! Hi Sarah: I’m in Ontario also and am a big fan of Yvonne’s! Her blog is the only American blog I read every single day. Hi I am from Ontario as well..I read Yvonne’s post every day.I look forward to it! She has taught me so much…Thank You Yvonne from all the ladies who love to decorate! I love the white pumpkins – so soft and so beautiful ~ I love how it looks with the hydrangeas – Just beautiful…. Yay! This got me so excited today. We have one more day of very hot weather, but they’re saying we should get some rain soon and actually start cooling down a little bit. This gets me very excited for Fall, and I’ve already started some early fall decorating. I am having a very hard time finding faux bittersweet that looks real though. My local craft stores just don’t carry anything that looks like it. We had a store in Austin called the Homespun Cottage, but she retired and closed. She carried the best florals! I sure miss it. I’ll continue my search, even online! Hi Karen & Yvonne – sometimes, here in Ontario, the blossom (or berries, etc.) part of the faux can look quite realistic BUT I find the stems/leaves look too fake and/or too bright of a green. So, what I do is either just remove the leaves (if they are the offensive part) or I get out my craft acrylics and dab some brown on the stems (leaves too, sometimes) then I’m much happier with the faux. My best bet for finding faux bittersweet is to get them at small local decor shops. 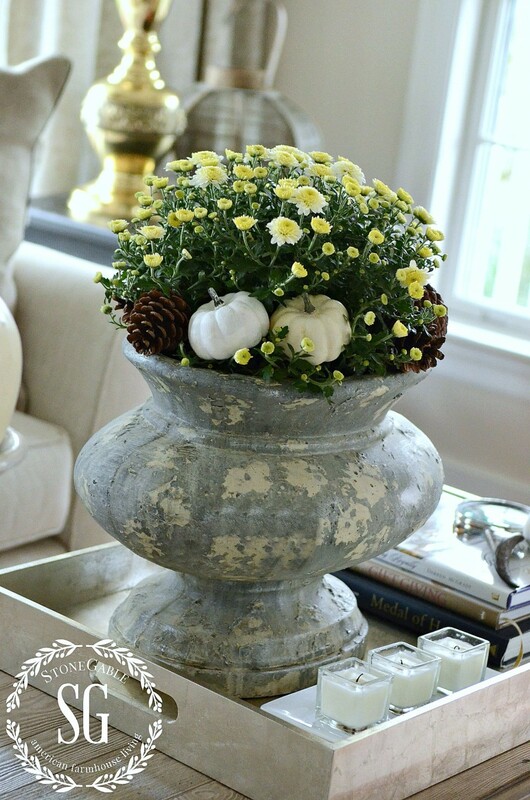 Fall is the longest decorating season of the year…. So, I love all your fall inspiration tips! Classic and beautiful!!! Thanks again for the information about bittersweet. I always wondered why it was so difficult to find. I truly enjoy following your blog and I think it is wonderful that you and your husband work as a team. Kudos to both of you for making this a great blog. I look forward to each and every post. Blessings to both of you! What a lovely post today, Yvonne! Fall too is my favorite time of year. Thank you for all the inspiration in bring Fall ideas into my home!